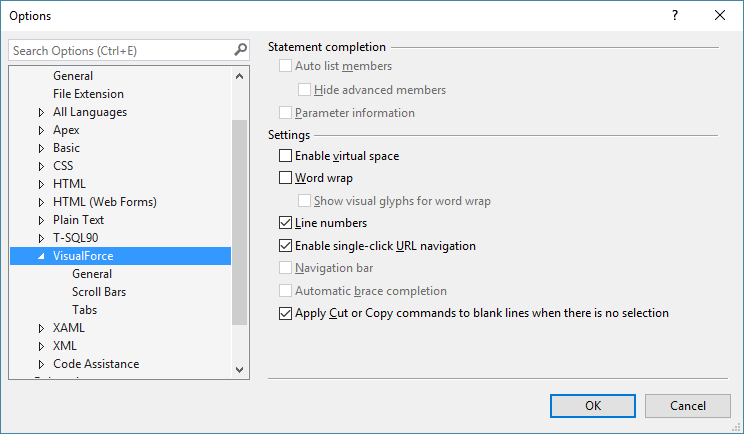 The Visualforce Editor, as well as all other text editors in The Welkin Suite, provides multiple basic and also advanced editing features that may decrease time spent on development. You can customize the Visualforce Editor as you want. To do so, go to the Options Menu: Main Menu ⇒ Tools ⇒ Options… ⇒ Text Editor ⇒ Visualforce. 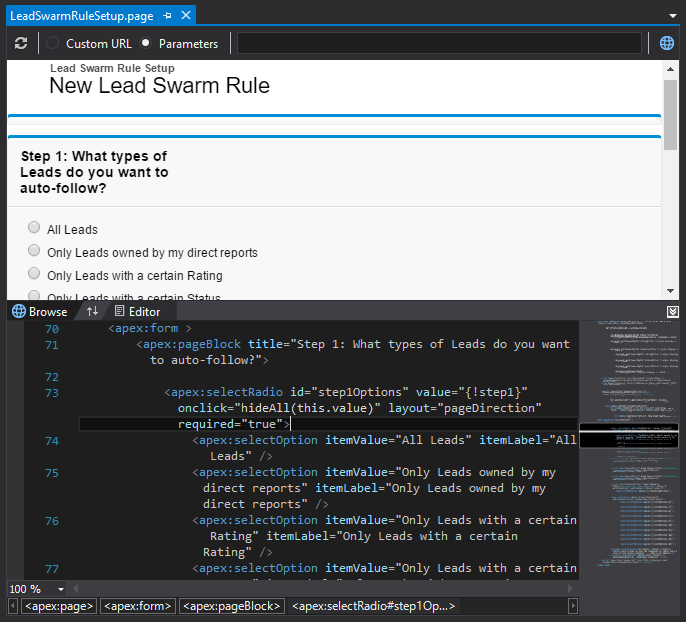 Once you open any Visualforce page, you can see a split-screen editor. In the lower part of the screen, there is the Visualforce code editor itself. While in the upper part of the editor you can see a preview of your page directly from your org. The Welkin Suite uses the Chromium browser engine for the previewer, so you can be sure that you see the same picture as most of your users will see. However, if you need to test a page in a different browser, you can do this using a button in the toolbar, which will open this page in your default browser. Custom URL radio button — if you'd like to check your Visualforce page, for example, on the public Force.com site as a guest user, check it and enter a full URL of the page that you'd like to use as a preview. Parameters radio button — if your page accepts or expects any GET parameters, you can easily pass them — just check this button and fill in your parameters to the text field in the top part of the previewer. The Welkin Suite remembers these settings, and even after reopening the IDE itself, it will fill-in the parameters / URL according to whatever you've used the last time. 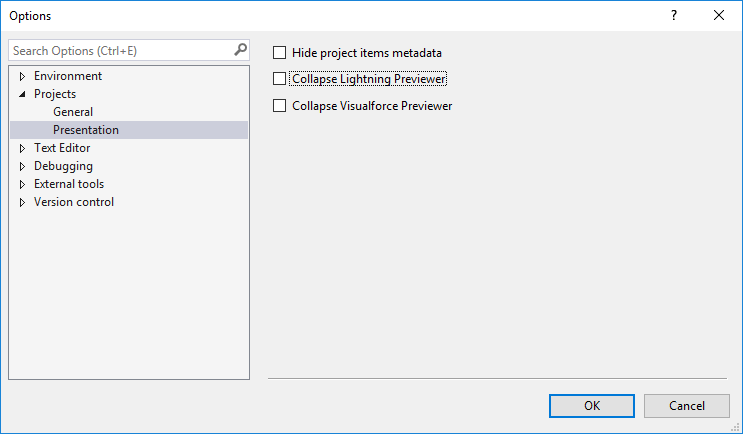 Each time you build changes in your Visualforce pages, the IDE refreshes the preview automatically. You can also do it at any time you need — just click on the Refresh button at the toolbar. You're also able to collapse Visualforce previewer by default. To do so, navigate to the Main Menu: Tools ⇒ Options ⇒ Projects ⇒ Presentation and check the box next to the Collapse Visualforce Previewer option. The Welkin Suite gives you a possibility to open Visualforce pages in a browser. Preview what the pages will look like, and make changes instantly. 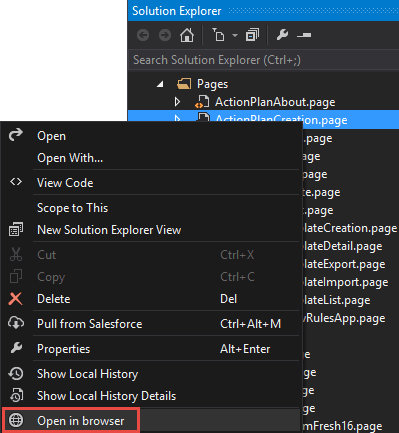 You can launch the preview mode via the option Open in browser, which can be found in the context menu of the Visualforce page in the Solution Explorer. For previewing Visualforce pages, The Welkin Suite uses the default browser.